After years of writing and reading code like this, I’ve slowly grown cold on the style. Notice the trailing conditional? A lot can go wrong with signs like these if the driver doesn’t make it to the final line of the text. Why might that happen? 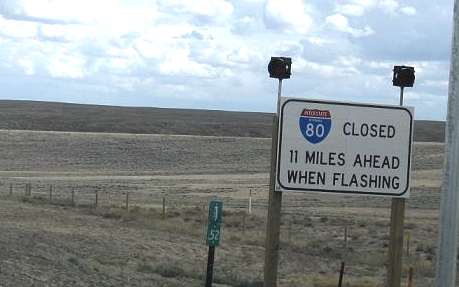 In this case, WHEN FLASHING is the key indicator on the sign. Why is it the last thing mentioned? In the world of journalism they call this burying the lead. If the sign designer place WHEN FLASHING first, the driver could often skip the rest of the text altogether2. This saves cognitive overhead that the driver can use elsewhere and avoids potential disasters that might occur if the conditional isn’t understood in time. What if you didn’t scroll over to see the unless at the end? You wouldn’t know what’s going on at all. Admittedly, method names of this length are rare, but it is common to have trailing conditionals nested inside other control structures that have the same effect3. Code is read much more often than it is written, so we need to optimize for readability over writeability4. Trailing conditionals tend to do the opposite. The first line memoizes the price_range, since this is apparently an expensive computation. Lines 2 and 3 are guard clauses. What would this look like with traditional conditionals? This works for me, but I prefer the return-first form because any time a method returns early we want to know about that ASAP. Think twice before slinging around trailing conditionals. They put the cart before the horse and in extreme cases they cause the reader to miss the horse altogether. This makes them often less readable than the traditional form. Or maybe Mitch was right and we all just need to read faster! If you enjoyed this Development post, you'll probably enjoy reading Art-directed, data-driven image files to accompany your website, List all Git commits that are on one branch, but aren't on the other, and A step by step guide to bulletproof 404s on Rails.